When Jews Were Funny is a seemingly straightforward title that promises both less and more than Alan Zweig’s unexpectedly provocative documentary delivers. The Toronto filmmaker’s stab at closing the book on American Jews’ enormous contribution to 20th-century comedy is funny ha ha, all right, but the laughs are more of the chuckle variety than outright guffaws. At the same time, the film is also a tad funny-weird, shot through with a personal streak that’s disarming and discomfiting in equal measure. Yet, when all is said and said – there’s no doing in this film, only talking – When Jews Were Funny is oddly satisfying. Zweig may be seeking answers but, instead of a mood of finality, his film has a catalytic effect. It invites every Jewish viewer to weigh in – personally and anecdotally, emotionally and sociologically – on the sources and state of Jewish humor on the long road from immigration to assimilation. Zweig achieves this unusual level of reflection by structuring When Jews Were Funny so that it feels like its viewers are party to a succession of conversations. Instead of buffeting the viewer with punchy sound bites delivered via rapid-fire cutting between interviewees, he serves up chunks of real-time interaction. It would normally be the smooch of death for a talking-head documentary to linger at length on the faces of its interviewees. But when they include Shecky Greene, Ed Crasnick, Howie Mandel, David Steinberg, Judy Gold, Gilbert Gottfried, Bob Epstein and Stewie Stone, we await with anticipation the next insight, witticism or off-the-wall remark. Paradoxically, and somewhat perversely, Zweig doesn’t lead with his best material. To the contrary, he makes the risky and self-effacing choice of opening with Shelley Berman, who’s baffled into near-silence by Zweig’s earnest questions. A legendary figure, Berman saw himself as a comedian who had to appeal to everyone – he didn’t do “Jewish” material. So, while it’s factually accurate to call him a Jewish comic and he takes pride in being Jewish, he doesn’t see himself as a purveyor of Jewish humor. So, he asks, what does Zweig want from him? At first, it seems that Zweig is on a quixotic quest to identify and define the qualities of Jewish humor, and Berman represents an awkward, inauspicious beginning, but we’re intrigued by a filmmaker who showcases his own pratfall – in the crucial opening minutes, no less – rather than leaving it on the editing room floor. Things improve for Zweig (and the audience) from here, and we’re treated to a variety of incisive analyses, off-the-cuff musings and entertaining meanderings from comics who span three generations. They pinpoint various characteristics of Jewish humor, from clever wordplay to an off-centre worldview to droll melancholia (which, depending on your perspective and the joke in question, might express defiance or fatalism). As a form of proof, and for classic straight-ahead laughs, Zweig intersperses brief, delectable clips of Alan King, Rodney Dangerfield, Harvey Stone, Henny Youngman and Jackie Mason performing on The Ed Sullivan Show in the mid-1960s. 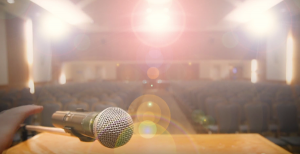 This was the golden age of Jewish stand-up, when Borscht Belt vets found mainstream success, and it coincided with Jews across America transitioning from outsiders to insiders. The viewer gradually realizes, however, listening to Zweig question and interact with his subjects, that he is propelled less by ethnographic interest than by some nagging personal dilemma. Almost imperceptibly, When Jews Were Funny begins to feel like a first-person documentary in which we continually hear but never see the protagonist (that is, the filmmaker). Zweig desires reassurance that the bittersweet experience and restless personality that drove so many wonderful Jewish comedians is not disappearing. It’s not giving too much away to say that Zweig remembers the joy of growing up with extremely funny uncles (never aunts) and grandparents, and frets that his young daughter will never know “old Jews.” He desires reassurance that the bittersweet experience and restless personality that drove so many wonderful Jewish comedians is not disappearing. A few interviewees call Zweig on his not-so-hidden agenda, pointing out good-humoredly that even his angst-fueled inquiry is uniquely Jewish. When Jews Were Funny taps into a large reservoir of affection and tenderness, which is not the first thing you’d expect to encounter with urban Jewish performers. Perhaps the film’s generous heart explains its award for best Canadian documentary at the Toronto International Film Festival last fall, since there’s nothing innovative or especially adroit about the filmmaking. That generosity extends to the audience. Zweig’s implicit concerns about the future of Jewish identity evoke, and include, our own. And what could be more Jewish than a large plate of jokes with a side order of gnawing doubt? 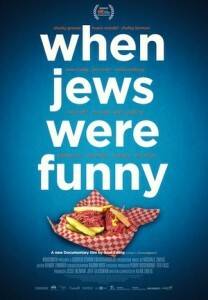 JI readers can get $1 off the digital download of the film, which screened last fall in both the Vancouver International and Vancouver Jewish Film Festivals, at whenjewswerefunny.com by using the discount code JEWISH. Michael Fox is a San Francisco film critic and journalist.